The Rectangular LiftTop Laundry Hamper features a contemporary look with a polished finish and design that compliments all decor and has a slim profile that takes up minimal floor space yet will hold plenty of laundry. The sturdy rim provides added strength and offers two comfortable, recessed handles for carrying. The hole design provides plenty of ventilation and the removable hinged lid keeps contents neatly concealed and will stay open for easy loading and emptying. The smooth plastic interior is snag proof and easy to clean. Two comfortable handles are integrated into the rim for lifting and carrying. The overall dimensions of this item are 19 1/8" L x 13 3/4" W x 22 7/8" H.
Overall Assembled Size: 19 1/8" x 13 3/4" x 22 7/8"
The sturdy rim and recessed handles make carrying comfortable. 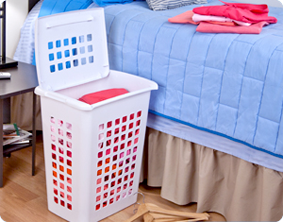 Lid hinges open for easy access to laundry. 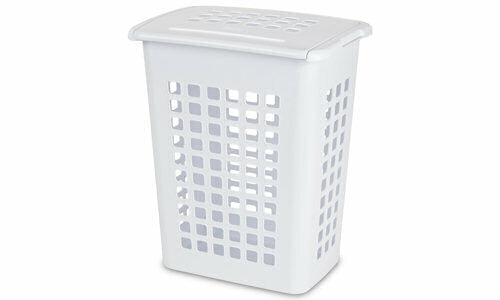 Rectangular LiftTop Laundry Hamper is rated 5.0 out of 5 by 4. Rated 5 out of 5 by KerryO from Overall/Excellent This basket is sturdy, helpful, easy to clean, and most important for me....made in the USA! The handle is the only part that has not been as durable as the rest of the basket, but it is probably because I overload it so much. It takes a beating and still does the job. Thank you for a quality made USA product. Rated 5 out of 5 by Maod from Can't seem to keep one. I've had to replace several of these off and on throughout the years. Not that they don't last, but because they seem to disappear whenever a grown child leaves home. Now that they are all gone, I won't have this problem! They are very sturdy, last a long time, and take a lot of abuse. One of my favorite Sterilite products! Obviously, my children think so also. 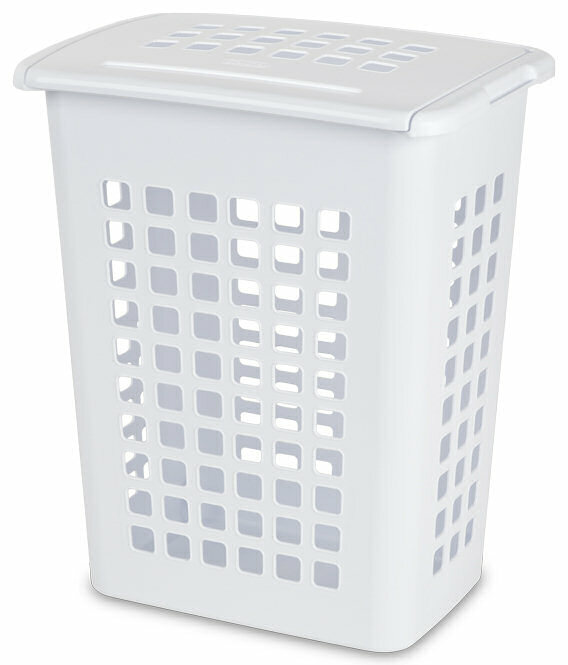 Rated 5 out of 5 by pahome from The sterlite laundry hamper is the best one we ever had! Made in the USA! Over the years, we have bought several brands of laundry hampers that did not hold up the way the Sterlite has. We added it to the many other Sterlite products in our home and have been more than satisfied!